SEATTLE OPERA has been attracting its fair share of talented, up-and-coming young performers of late. Among those is Jason Collins, a young American tenor who is singing the role of the Steersman in Seattle Opera's production of Wagner's "The Flying Dutchman," opening Aug. 4. Collins has been busy since finishing a two-year hitch in the Pittsburgh Opera Center young artists program just two years ago. He had a banner year in 2005 when he made three mainstage debuts in the roles of Erik in Wagner's "Flying Dutchman" at Arizona Opera, Lensky in Tchaikovsky's "Eugene Onegin" and Zinovy in Shostakovich's "Lady Macbeth of Mtsensk." In 2006 and 2007, Collins performed several times as a concert soloist. 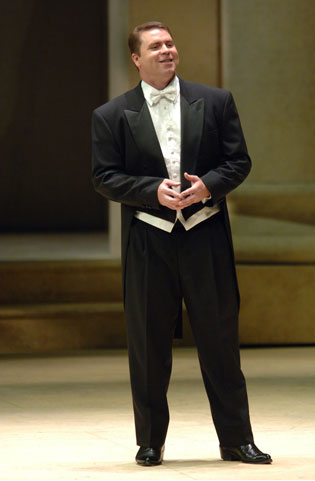 By 2007, besides his maiden voyage on Seattle Opera's mainstage, Collins was scheduled for the role of Giove in Monteverdi's "The Return of Ulysses" at Chicago Opera Theater. And after his Seattle appearance, Collins is heading to Toronto, Canada, to sing the part of Le Comte de Lerme while understudying the title role in Verdi's "Don Carlos" at the Canadian Opera Company. The 34-year-old tenor, a finalist in Seattle Opera's International Wagner Competition this past August, noted that his career seems to gradually be moving in a Wagnerian direction. Next year, in fact, Collins is slated for the role of Froh in "Das Rheingold" at the San Francisco Opera. All of which suits Collins just fine. "Mainly the music that does speak to me is Germanic/Slavic," Collins says. "And that seems to be the direction my career is heading in." Of course, that makes Seattle Opera, with its emphasis on Wagner, the perfect place for Collins to perform. "I'm an American opera singer. You grow up, and this is the house where you want to do Wagner out of all the houses in the country." Collins is a level-headed performer who understands that he is still cutting his teeth in the Wagnerian repertoire, and that learning in general is an ongoing obligation for any opera singer worth his salt. "You never stop learning," he said. "It was only my 'official' training that ended two years ago." Collins compares rehearsing for "The Flying Dutchman" at Seattle Opera to attending a finishing school where he can polish his work by learning from fellow artists of the caliber of singers Jane Eaglen and Greer Grimsley, director Stephen Wadsworth and conductor Asher Fisch. Collins says, however, that this array of talent is also intimidating. "I told Speight Jenkins [Seattle Opera's general director], 'I'm like a deer in the headlights. I'm in awe of all of these people and I'm afraid to mess up.' Speight puts his hand on my shoulders and says, 'Mess up. You're here for rehearsal.'" In "The Flying Dutchman," a curse dooms a ship's captain to sail the oceans, allowing him to land only once every seven years to find true love, which is the only thing that will break the spell. Dramatically, the small role of the Steersman will play a significant part in the Seattle production, according to Collins. "The role of the Steersman is important because his aria sets up the longing and desire of everyone in this opera. Fisch colors the aria with a lighter, sweeter texture that conveys as much longing as the Dutchman's music, but the Steersman's music is not as complicated as the Dutchman's. Fisch is a genius at finding every color and style." Collins says that Wadsworth has been encouraging the singer to explore his character and bring honest emotion to the role. "The audience will only cry if something real is coming out." SEATTLE OPERA'S "THE FLYING DUTCHMAN"
Plays at Marion Oliver McCaw Hall, 321 Mercer St.